While traveling around the world for work can throw off even the most dedicated Fitbody, Michelle Burke has found a way to balance her demanding schedule with a healthy lifestyle. You might find her jetting to Europe for work or hitting the waves surfing for cardio but one thing is for sure, where ever she is, she is making her fitness a priority. But things were not always that way. At her heaviest, Michelle Burke was 215 lbs and unhappy. Today she feels strong and beautiful and has made the transition to feeling excited about gaining weight (muscle)! I am thrilled to share more about this incredible woman and how Michelle Burke makes fit happen! How long have you been doing online personal training with Julie Lohre? I’ve been training for many years in various ways but have been working with Julie Lohre in her online personal training program periodically for the last 3 years. I love that I can work with her for 2-3 eight week training sessions, reach my fitness goals and then take some time away to do it on my own. Whenever I need a boost or more motivation, I contacted Julie Lohre again and we start back with a new training session. What drives you to lead a healthy, fit lifestyle? I’ve been training for many years in various ways. I moved to bodybuilding from powerlifting when my travel schedule picked up at work and I could no longer hold to my training schedule on the road without a spotter. What does a typical week look like for you including your training? It’s pretty typical for me to be in the gym lifting 3 – 4 days a week. I follow whatever plan Julie Lohre devises with my online personal training and she changes it to challenge and interest me. My gym time is truly my stress relief! If I don’t get it in, I’m a complete bear! For cardio, I let the weather drive what activity I execute. I’m a sucker for being outside so I will go for a nice run through the park over the treadmill any day. Ideally, surfing is my passion and that’s my cardio of choice if the waves and weather cooperates! What challenges do you face that sometimes come between you and your fitness goals? I have the typical challenges that most women face: work, house chores and family commitments. I’ve learned to make myself a priority and put ‘me’ first so that I can truly lead a healthy lifestyle. One of the hardest things I’ve ever done is move to another country for work without my family. My nutrition and my training suffered initially, but now it’s my respite. Without it, I don’t know how I would have managed the stress and homesickness I felt! What has helped you the most to overcome those challenges? One of the best quotes that I use to anchor me are words from Robert Eliot, “It’s important to run not on the fast track, but on your track. Pretend you only have six months to live and make three lists: the things you HAVE to do, WANT to do and neither have to do nor want to do. Then, for the rest of your life, forget everything on the third list.” This helps me prioritize what’s truly important and what is just ‘static’ in your life. For me, I found I was saying ‘yes’ to things when I should have been saying ‘no’. Now, I read this and it’s so clear to me what I need to do and what I don’t need to do. It’s very refreshing! From 215 to lean and tight…Michelle Burke has made incredible changes in her physique with Julie Lohre’s Online Personal Training Program for Women! 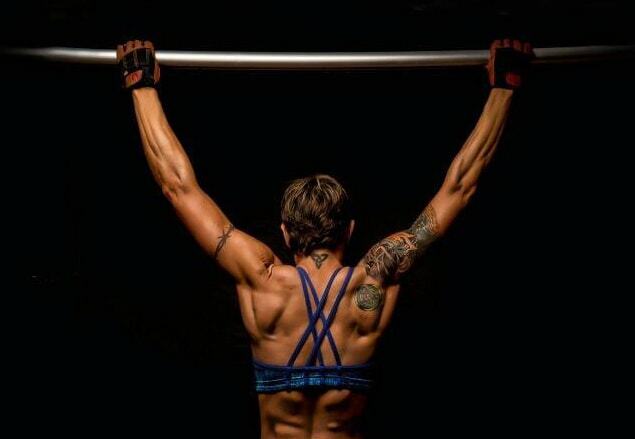 What words of inspiration do you have for other women that are struggling with their fitness? I’m a real sucker for a grass-fed burger (no bun), baked sweet potato fries and a pile of veggies (I’d have to say that spinach in my favorite – maybe that’s the whole Pop-eye thing). hahahahha! What has been your experience working with Julie Lohre as your Online Personal Trainer? A friend of mine referred me to Julie Lohre. I was thrilled to give her a try as I had gotten ‘stuck’ on my own. I had tried all kinds of crazy things to get rid of cellulite (yes, vegan for a month), which didn’t work and left me frustrated. I decided to sign-up with Julie Lohre in her Online Personal Training Program last December. 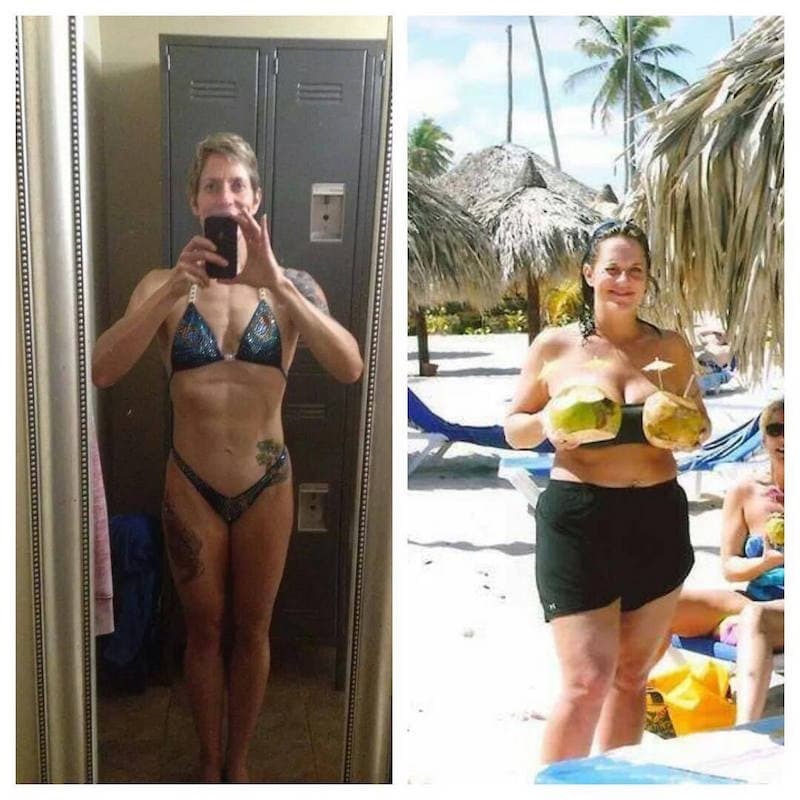 Julie’s plans are foolproof and takes the guesswork out of both training and nutrition for me. I have a busy and stressful job so her coaching is invaluable to me. She is always so responsive and positive! The only con I have for Julie is she doesn’t live across the street! Hahahaha! At some point, I would love to meet her! I wouldn’t trade her for a million dollars.